This follows a get together last week by the students with businesses and community organisations in Eden last week. The representatives from EB2 Phone Repair, Eden Library, SEWAC and Mark Anthony’s shared their ideas about how young people can be actively involved in their local area. To prepare for the visits students worked on sharpening their communication skills, body language awareness and how to ask questions that are clear and concise when asked about the services the business people offer, how they started and how they benefit the local community. The promotional Gen-l T-shirt will be sold to fund an end of project community celebration in November. The students will be pitching their idea to local businesses and organisations to gain support and assistance and any organisation willing to support the project will have their logo included on the shirts. They are hoping business people will support the Gen-I T-shirt project by hearing the students pitch their ideas; providing in-kind assistance such as graphic design skills, fund raising suggestions or equipment to make the T-shirts; connecting the students with other people or resources; or financial sponsorship. For more information about the project, email Council’s Youth Engagement Officer Emma Stewart at estewart@begavalley.nsw.gov.au or phone 0432 073 741. 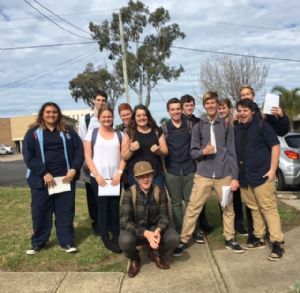 Photograph: Gen-l students Kirsty Marlow Sheedy, Ryan Vandermay, Tom Burn, Daniel Holka, David, Spencer, Pheobe Lymburm, Janitta Larkham, Zac Luimes, Byron Lincon, Ryan Hayden and Harrison Mcpherson (front) on the trail of advice and support from den business and community members.